There are lots of “ifs” in this scenario. It is a long shot, simply because the structural constraints are really strong — in a country with lax party discipline and fluid partisan attachments, it is unlikely that power-seeking retired generals and businessmen will give up the parties that they have spent so much money to create. 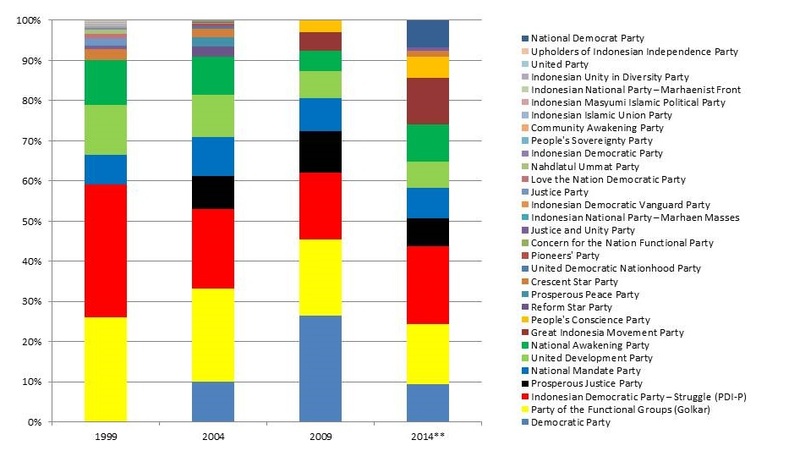 What I did not expect, of course, was that PDI-P would fail to reach 20% of the popular vote. This is one of the “ifs” that I hadn’t anticipated. There is little more that I could add that hasn’t been said by others who watched the vote unfold, and from 10,000 miles away from the action, there’s no real on-the-ground insight that I can provide. I’d recommend four quick reads for those interested in learning more from those who were there.